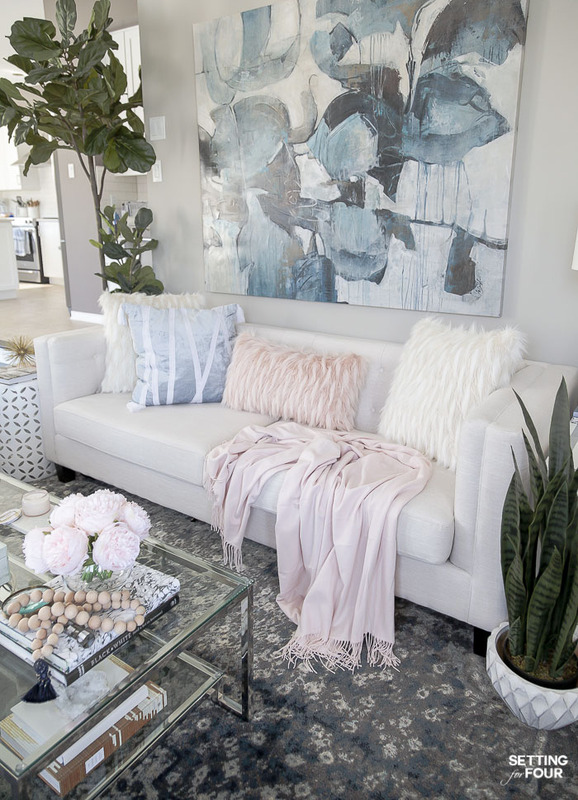 See my blush pink and blue house tour and transitional living room ideas in my Seasonal Simplicity Spring Home Tour! 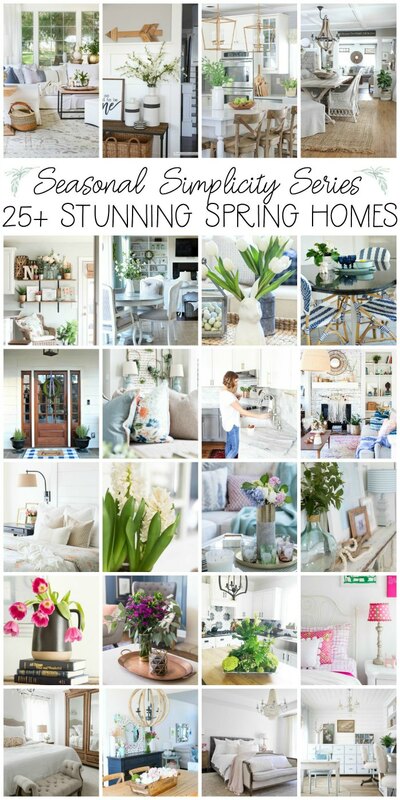 29 talented bloggers are sharing their Spring home tours here too – you’ll discover tons of beautiful Spring decor ideas for your home! 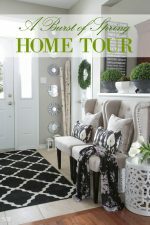 I’m sending a big thank you to my friend Krista at The Happy Housie for organizing this Seasonal Simplicity Home Tour today!! If you’re coming from my beautiful friend Summer’s home at Summer Adams – welcome! 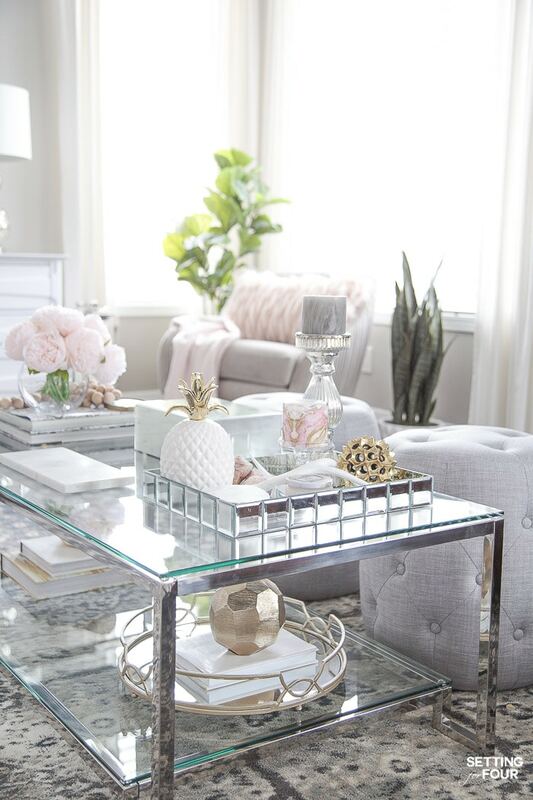 I just know you loved seeing her gorgeous new home styled for Spring! I’m so excited that you are here and I can’t wait to show you how I’ve decorated my home with my newest color crush blush pink! 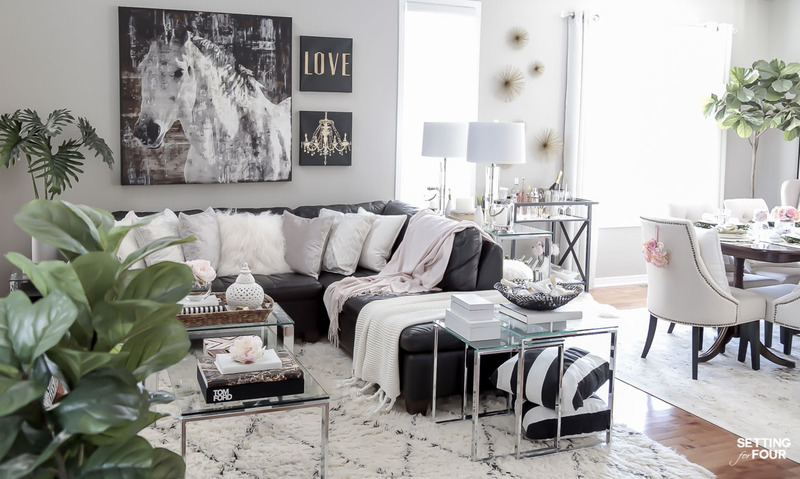 If you’re new here – I’d love for you to take a look around my website – read all about me and our military family here, all of my decor and design tips here and see all of my home decor and furniture here! Let’s start with today’s tour of my living room! I have to be 100% honest here – I was going to share my guest bedroom today too but I ran out of time so I’m going to share my guest bedroom with you next week! As you can see our living room has neutral bones ( billowy white curtains, gray walls, gray and oatmeal colored furniture ) accented with this gorgeous indigo blue area rug. I love to layer in lots of mixed metallics into our rooms…gold, silver, champagne, nickel. Did you know that a big design trend for 2018 is to mix your metals? 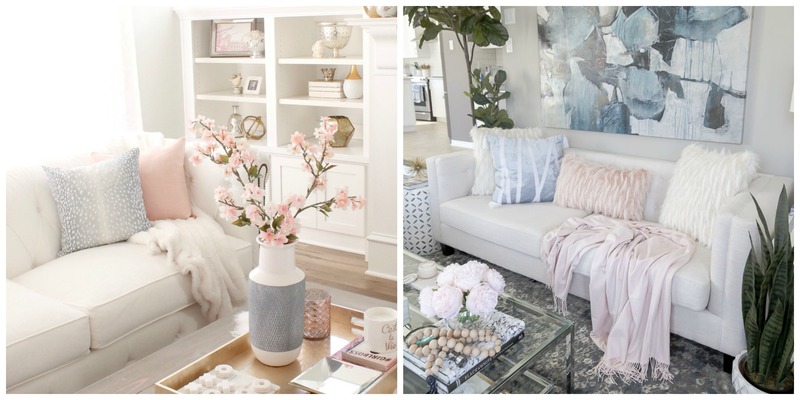 And the really exciting color I’ve been using lately is blush pink! I’ve added it everywhere in my home and I just love it! This shade of blush pink has a beige undertone – so it pairs really well with white, gray, black and beige. Shop the Look! Click on each picture and Scroll with the arrows to see more information about each item! These gray linen tufted ottomans are so handy for extra seating – you can use them as tables to set trays on too! I bought these at Walmart – they are currently sold out but you can check here for similar styles! 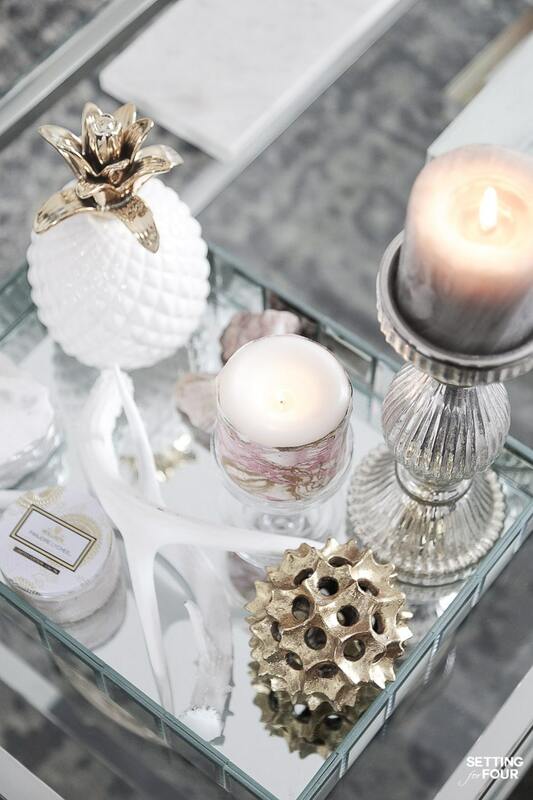 I styled my tiered coffee table (which I’m obsessed with – you can see it here!) with lots of candles, pink accents, gold and mercury glass. I love the sparkle and shimmer! 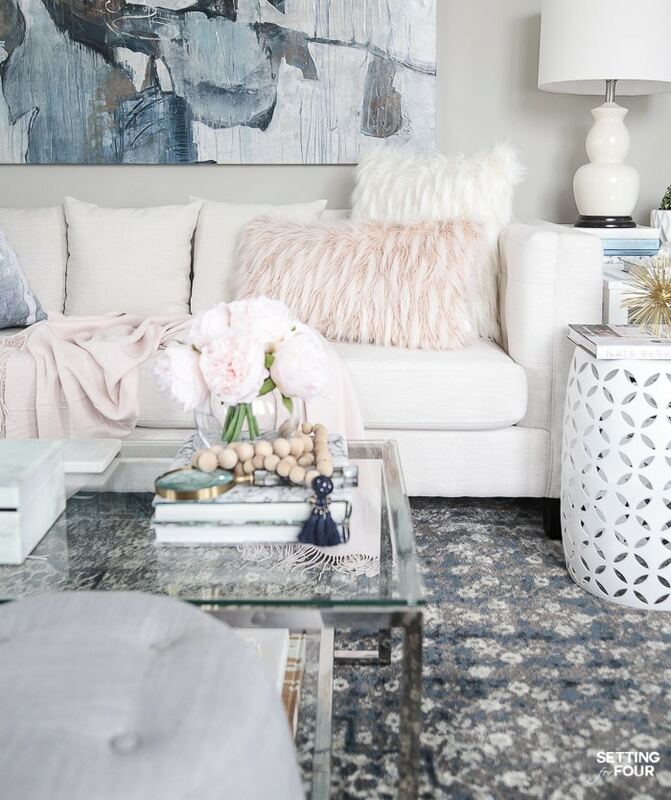 Doesn’t the pink go perfectly with the indigo blue rug, the white, gray and gold! This is a color palette I’m really crushing on right now because it’s not overly feminine but it’s fresh and light! 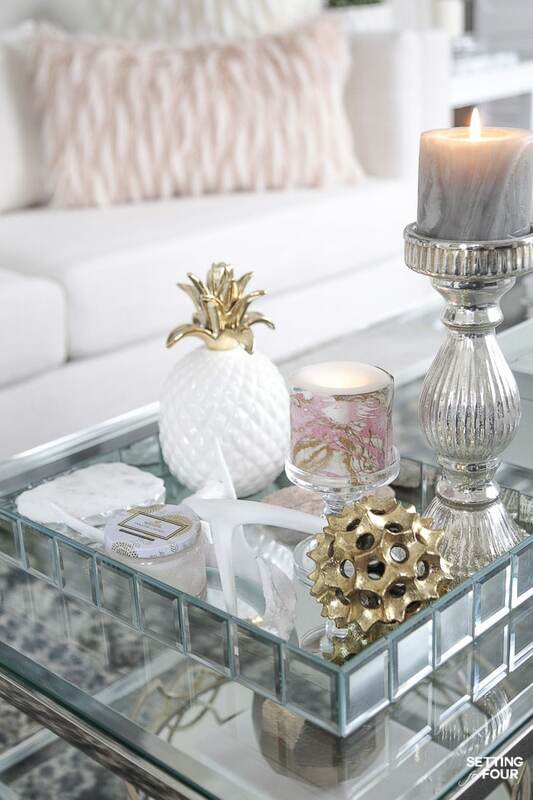 Of course I had to add one of my pineapples from my collection to this tray – did you know that pineapples are an international symbol of welcoming and hospitality? I’m so excited to show you my new West Elm Roar + Rabbit swivel chair! Isn’t it beautiful? I love the pleating detail on the sides and back and I’m in LOVE with the gold legs! It’s so comfortable, so soft ( it’s performance velvet so it will hold up to spills but is incredibly soft! ) and so incredibly stylish! I ordered it in this beautiful greige ‘Stone’ color but it comes in lots of other colors including a gorgeous pink. I almost went for the pink version but the stone color is more timeless and I’m all about timeless decorating! I’ll be sharing another post on my new chair with you next week! And this stunning snake plant is a new addition to our living room – a big thanks from my friends at Museum Trees who sent it to me. Isn’t it beautiful? I can’t believe it’s faux! It’s so incredibly life like and the coloration is exactly the same as a real snake plant! I love the big vertical leaves and the texture it brings to our living room! 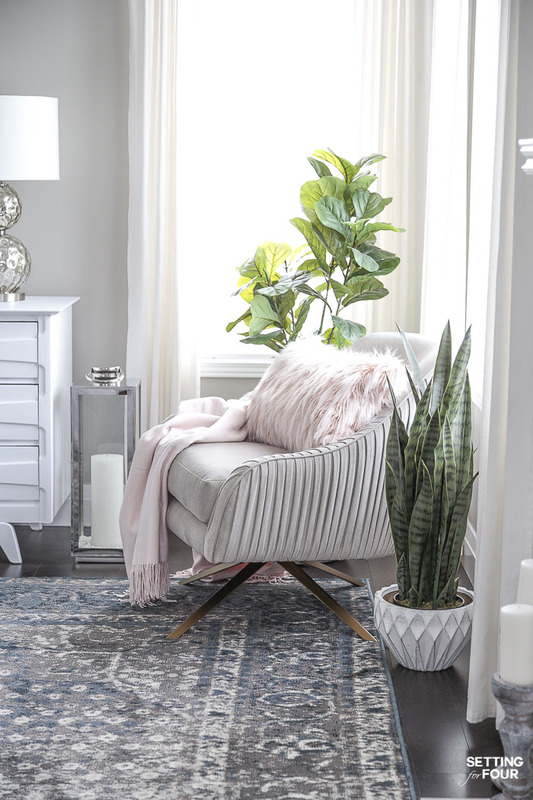 Snake plants are a big trend right now in houseplants – adding one to your home will give a fresh new look to your space. Plus you don’t have to worry about watering it while your on vacation! This is a spot where I enjoy the morning sunshine with my coffee and catch up on Instagram inspiration! Here’s a view of our sofa and the oversized blue abstract canvas art I hung above it! Large scale art is another big trend this year! I love how it ties in with our indigo blue rug! I layered in the blush pink here too. 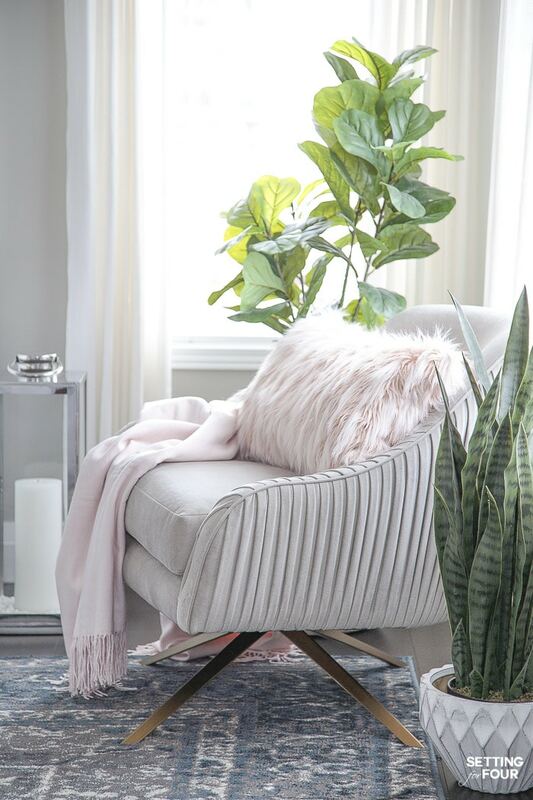 I ‘m really loving the addition of these blush pink accents to our home for Spring – I hope you’ve enjoyed seeing them in our home too! I have some more projects planned for our living room this year! I can’t wait to show you! 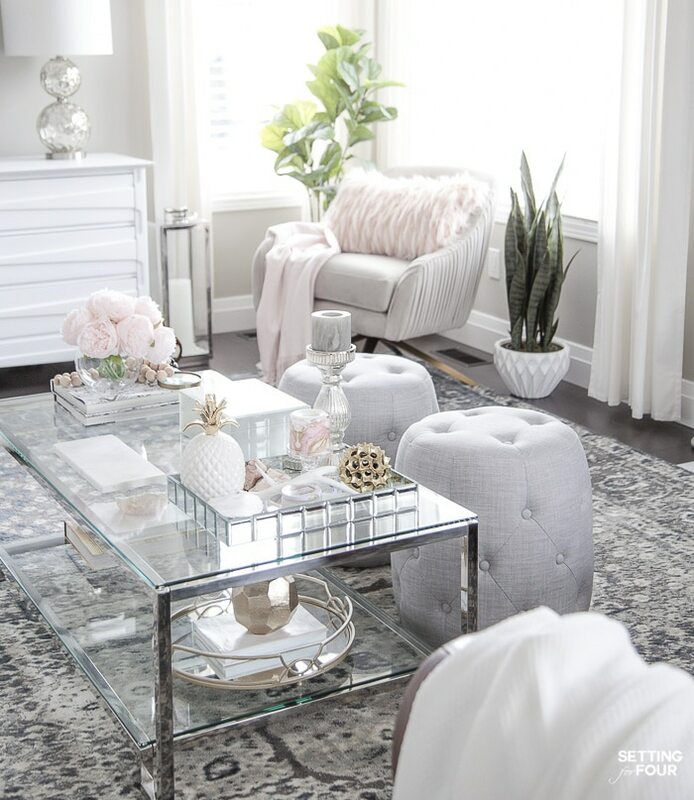 I’ll be sharing my bedroom decor ideas for Spring later this week – so please stay tuned for the blog post! You can also see my Blush Pink and Neutral Entryway, Family room and Dining room here. 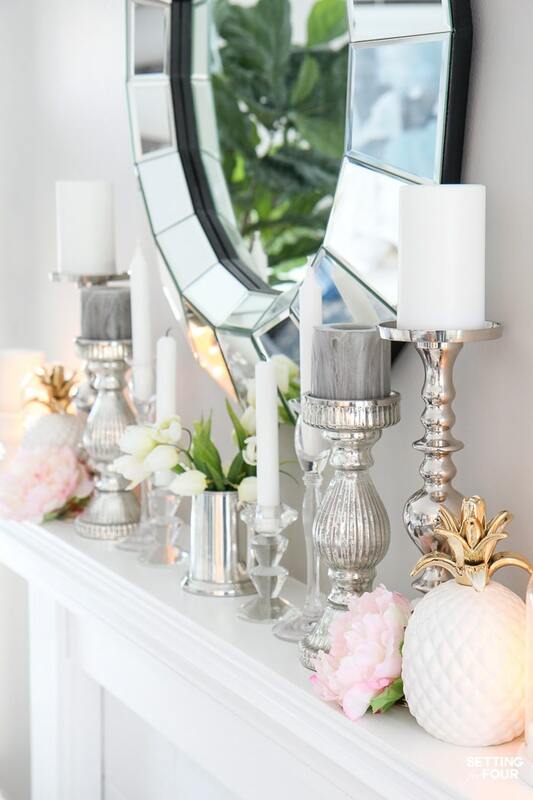 ….and my Spring Mantel here! I hope you enjoyed my blush pink and blue house tour! 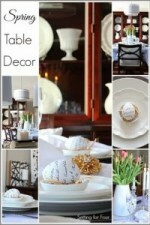 Now grab a cup of coffee and see my friend Krista at The Happy Housie home styled for Spring! Such beautiful rooms, but do you actually use these on a regular basis? I would be afraid to sit on your furniture or drink a coffee in that pretty chair for fear of spilling a drop! This is so pretty with all the blush accents! I am really crushing on that West Elm chair. Thank you for sharing your beautiful home with us! Gorgeous tour, Heather! I absolutely love your colour combo and how everything feels so light and bright and sparkly!! So glad you could be on this tour! Your home is so beautiful, Heather! I love all the pops of pink and blue! So beautiful. Such a lovely, beautifully decorated home you have! I love the pot that is holding the faux snake plant. Can you tell me where I might find it – or something very similar? I have a snake plant that I would love to put in my home office and that pot would be perfect!